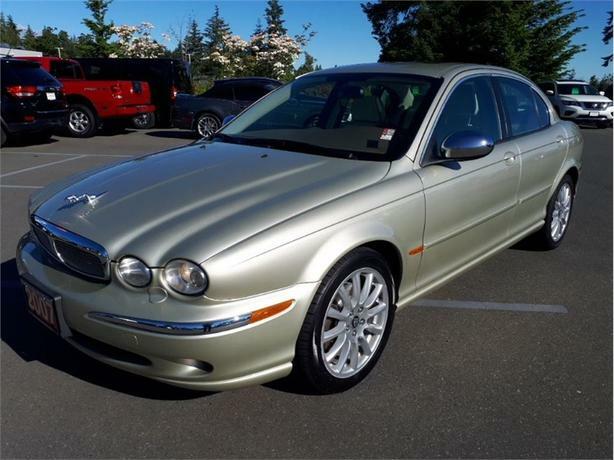 Sturdy and dependable, this 2007 Jaguar X-TYPE 3.0 makes room for the whole team. Reflectors in lower front door panels, Occupancy sensing airbag system-inc: driver position & passenger weight, Lower anchors & tethers for children (LATCH) system, Knee bolster airbag, Height-adjustable front safety belts w/pretensioners. Feel Safe on the Road with Your Jaguar X-TYPE Front/rear side-curtain airbags, Dynamic stability control (DSC), Driver/front passenger side-impact airbags, Driver/front passenger frontal airbags, 4-wheel anti-lock brakes w/electronic brake distribution (EBD), emergency brake assist, 3-point safety belts for all seating positions.The Experts' Verdict...As reported by KBB.com: If you're looking for a compact premium luxury sedan with all-wheel drive, a lavish interior and a price that's a relative bargain, the X-Type should make your shopping list. Fully-Loaded with Additional OptionsWood-trimmed gear shift knob, Sunvisors w/illuminated vanity mirrors, Stowage pockets in front seat backs, Sapele wood trim, Road speed-sensitive variable-ratio pwr rack & pinion steering, Remote keyless entry, Reflectors in lower front door panels.Stop By Today For a must-own Jaguar X-TYPE come see us at Comox Valley Nissan, 535 Silverdale Crescent, Courtenay, BC V9N 4B4. Just minutes away!